Well, this site is some Japanese geek's personal website that rarely gets updated. 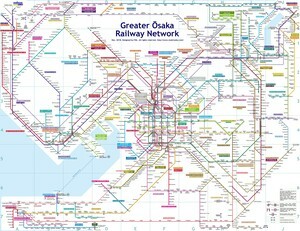 The site deals with my personal (and completely useless) interests such as anime or games, but in case you don't know Japanese, I bet the reason you've come here is to see my railway maps. So here they are. Hope you enjoy them. Raiway map RAQs (rarely asked questions) - in case you have any questions. 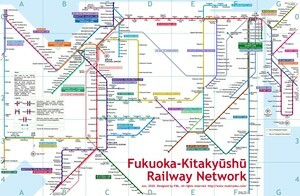 Japanese railway operator logo collection - in case you don't feel like looking at maps. Non-railway logos in Greater Tōkyō - in case you are mode interested in ferries or rickshaws. 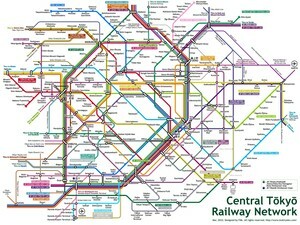 This joke map is a rip off from inspired by this London map. You won't really get the joke unless you have fairly rich knowledge of Japanese popular music. 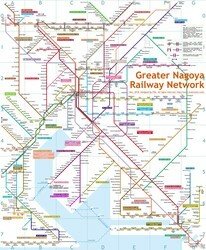 Greater Tōkyō/Yokohama Area 2020, version "too positive"
I included future plans that may or may not come into reality, such as Kawasaki Subway or Maglev Chūō Shinkansen. Station names and such are nothing but my wild fantasies. Planeed network as of 2020. Shànghǎi Metro, Intercity Lines, PDLs, and Shànghǎi Maglev. Planeed network as of 2020, Greater Taipei/Keelung/Táoyuán Area. 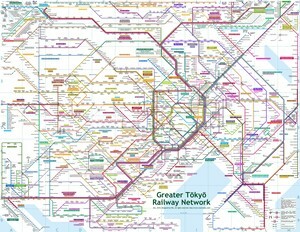 MRTs, LRTs, TRA Lines, and Taiwan HSR.